TRIO has a rich history of designing team stores and sporting goods stores. Drawing from our experience we’ve gathered a selection of fine displays and fixtures specifically designed for the sports retailer. 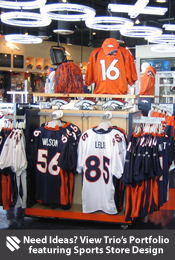 While we offer an extensive selection of clothing displays, we also carry specialty fixtures such as hat displayers, ball displayers, and acrylic t-shirt displays. Our smartly priced light boxes are an excellent way to showcase the big graphic images so key to the sports retail environment. If you don’t see what you need, please give us a call. 1 (800) 454-4844.